127 pages with diagrams and plates. Octavo (8 1/2" x 6") issued in pictorial wrappers. Bibliotheca Van der Linde-Niemeijeriana:1610. signed 1st edition. Efim Dmitriyevich Bogoljubow (Bogoljubov, Bogolyubov) (Russian: Ефи́м Дми́триевич Боголю́бов; April 14, 1889–June 18, 1952), was a leading Ukrainian-German chess Grandmaster. In 1911, he tied for 1st-2nd in Kiev championships, and tied for 9-10th in Saint Petersburg (All-Russian Amateur Tournament, Stepan Levitsky won). In 1912, he took 2nd, behind Karel Hromadka, in Vilna (Hauptturnier). In 1913/14 he took 8th in Saint Petersburg (All Russian Masters' Tournament – 8th RUS-ch; Alexander Alekhine and Aron Nimzowitsch won). In July/August 1914, he played in Mannheim (19th DSB Congress), and tied for 8-9th in interrupted tournament. After the declaration of war against Russia, eleven “Russian players” (Alekhine, Bogoljubow, Bogatyrchuk, Flamberg, Koppelman, Malyutin, Rabinovich, Romanovsky, Saburov, Selesniev, Weinstein) from the Mannheim tournament were interned by Germany. In September 1914, four of them (Alekhine, Bogatyrchuk, Saburov, and Koppelman) were freed and allowed, through Switzerland, to return home. The Russian internees played eight tournaments, the first in Baden-Baden (1914) and all the others in Triberg (1914–1917). Bogoljubow took 2nd, behind Alexander Flamberg, in Baden-Baden, and won five tournaments in Triberg (1914–1916). After World War I, he won many international tournaments; at Berlin 1919, Stockholm 1919, Stockholm 1920, Kiel 1921, Peštany 1922. He tied for 1st-3rd at Carlsbad 1923. In 1924 Bogoljubow came back to Russia (then Soviet Union) and won twice the Soviet championships (1924 and 1925). He also won at Breslau 1925, and at Moscow 1925, ahead of Emanuel Lasker, José Raúl Capablanca, etc. In 1926, he emigrated to Germany. He won, ahead of Akiba Rubinstein, at Berlin 1926. Boboljubov won two matches against Max Euwe (both 5,5–4,5) in 1928 and 1928/29 in Holland. He played matches for the World Chess Championship twice, both times against Alexander Alekhine. In the first in 1929 he lost 15.5–9.5, in the second in 1934 he lost 15.5–10.5. 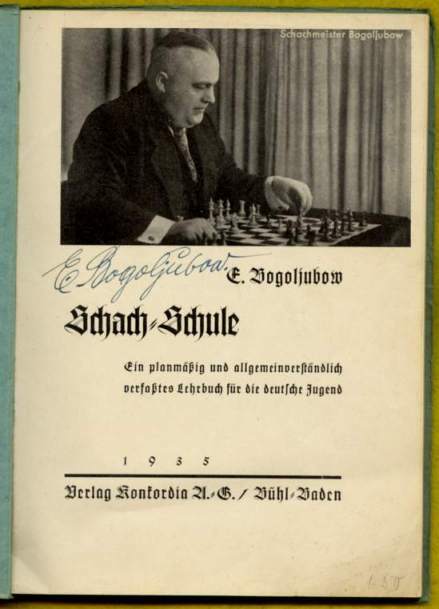 He represented Germany at first board in the 4th Chess Olympiad at Prague 1931. He won an individual silver medal there (+9 –1 =7). In 1930, he twice tied for 2nd-3rd with Nimzowitsch, behind Alekhine, in San Remo, and with Gösta Stoltz, behind Isaac Kashdan, in Stockholm. In 1931, he tied for 1st-2nd in Swinemünde (27th DSB Congress). In 1933, he won in Bad Pyrmont (1st GER-ch). In 1935, he won in Bad Nauheim, and in Bad Saarow. He tied for 1st-2nd at Berlin 1935, Bad Elster 1936, Bad Elster 1937. 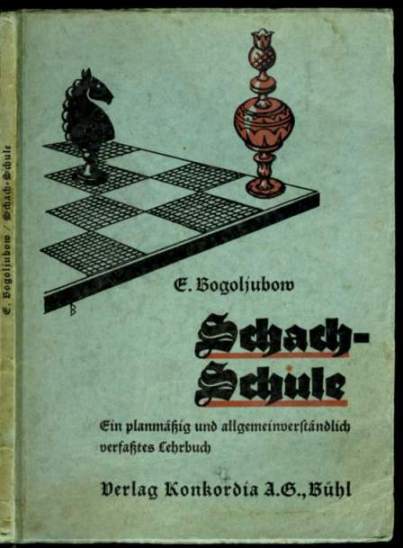 Bogoljubow won at Bremen 1937, Bad Elster 1938, and Stuttgart 1939. (1st Europa Turnier) During World War II, he lost a match to Euwe (+2 –5 =3) at Krefeld 1941, and drew a mini-match with Alekhine (+1 –1 =0) at Warsaw 1943. He also played in several tournaments held in Germany and General Government. In 1940, he won in Berlin, and tied for 1st-2nd with Anton Kohler in Krakow /Krynica/ Warsaw (1st GG-ch). In 1941, he took 4th in Munich (2nd Europa Turnier; Stoltz won), and took 3rd, behind Alekhine and Paul Felix Schmidt, in Krakow/Warsaw (2nd GG-ch). In 1942, he took 5th in Salzburg (Alekhine won), tied for 3rd-5th in Munich (1st European Championship - Europameisterschaft; Alekhine won), took 3rd in Warsaw /Lublin/ Krakow (3rd GG-ch; Alekhine won). In 1943, he took 4th in Salzburg (Paul Keres and Alekhine won), and tied for 2nd-3rd in Krynica (4th GG-ch; Josef Lokvenc won). In 1944, he won, ahead of Fedor Bogatyrchuk, in Radom. After the war, he lived in West Germany. In 1947, he won in Lüneburg, and Kassel. In 1949 he won in Bad Pyrmont (3rd West GER-ch), and tied for 1st-2nd with Elmars Zemgalis in Oldenburg. In 1951, he won in Augsburg, and Saarbrücken. He was awarded the title International Grandmaster by the World Chess Federation FIDE in 1951. The Bogo-Indian Defense chess opening (1.d4 Nf6 2.c4 e6 3.Nf3 Bb4+ in algebraic notation) is named after Bogolyubov. Edge wear, corners bumped, 1/4" tear at front heal hinge, soiled else a good to very good copy.